Hey, we know what it’s like to have little picky eaters at home, both in human and puppy form and we heard that Shibas fall into that category sometimes. 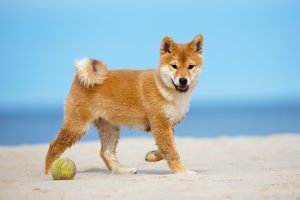 That’s why we’ve come up with some healthy suggestions for our customers who have purchased our Shiba Inu puppies for sale. A healthy diet is a key to a healthy pup and we want the very best for you and yours. Take a look at these products that you can find at your local grocery store or in your home cabinets. Bacon Bits – Bacon bits is another favorite. They are also perfect to use as training treats. As with any of the suggestions we are giving you, please use them in moderation, especially if you’ve recently brought home Shiba Inu puppies for sale. Their digestive systems are still sensitive and are maturing. Bacon bits are particularly high in salt and fat and too much salt can induce vomiting in dogs. Vienna Sausage – These are salty treats too but we recommend that before you serve them to your Shiba, they are rinsed and soaked in water for about 3 to 5 minutes. This will help to eliminate some of the sodium. Believe us, these bite-sized pieces of heaven will get your Shiba’s attention and they’ll be ready for just about anything! (Sidenote, pop some pieces in a microwave after soaking to enhance the smell and make it even more enticing to your dog. Get ready for some serious training time! Boiled Chicken and Brown Rice – This may not be the most appetizing treat, dare we call it that, but it surely is healthy. Boiled chicken and brown rice are a favorite and go-to especially if your pup has an upset stomach. Cooked chicken with absolutely no seasoning will help your pup mend his tummy. However, even if he’s not sick, he’ll gladly eat this healthy meal.